Stephanie Schwandner-Sievers is Nash Fellow and Lecturer in Albanian Studies at the School of Slavonic and East European Studies, University College London. 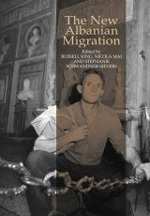 This book examines one of Europe’s newest and most dramatic mass migrations – the exodus of a significant share of the Albanian population since 1990. Drawing on a range of richly documented and rigorously researched case studies, the volume presents a detailed picture of this mass exodus and its multiple effects on Albania, the destination countries, and the migrants themselves. 2 Lifestyles and integration of Albanian women in Bologna: Two steps forward, one step back? 5 Albanian migrants’ remittances: A development opportunity?